maybe nothing too interesting, maybe nothing out of the ordinary. My first experiences of church were fantastic! I was born again at the age of 6.. I knew there was a God! with what they were saying at church. I began to lie to my family and live a life that no-one in my Sunday school class would appreciate. I was growing up in the 70s and enjoyed being the disco diva far more than church. And yet...? At age 17... I became very very ill. There were a couple of long hospital stays..
Ulcerative colitis bought on by stress and a bad diet and too much emotion. I didn't care to be a baby any more. Despite frequent bouts with my chronic illness I immigrated to the States and met my husband Ron. We had 3 beautiful boys, who needed... a religious education. I knew for sure there was a God and started looking for him again. Church in America was a strange thing for me. being a Sunday school teacher a scout leader.. trying to be a good Mom, putting my family first. Still I was sick with the Colitis, for years. 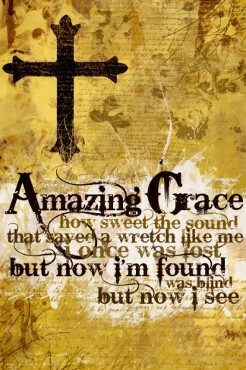 One day I happened across a book in the store, "Amazing Grace" was the title. We all the know the hymn. It was a dictionary of religious words and one of the words was "grace". and sent him a beautiful dream and had seen in him many great things. me a coloring book and crayons to go to school with. I said No... it wasn't what I wanted for my birthday..
the 3 kids slumped their shoulders and started to walk away. I had an epiphany! What if they were looking at something in me..that I couldn't see in myself? What if they were looking at me the way I wanted other people and God and the world to look at me. For the first time.. God became the encourager and no longer the judge! and the colitis began to calm down and God was with me, for a while! I was home alone, fat, depressed, and the under achiever, the colitis creeping back with me. I was alone.. a long way from home..
growing older and wondering what the heck I was doing in the States of all places! What had I been thinking! I needed to go home.. I needed new goals I needed to reinvent me...why was I so miserable? I decided I was going to lose weight, I started to exercise, I went on a pilgrimage...alone. I took a 6 week hiatus from my life... like Jacob, I ran away. I prayed, I waited for the dream. who showed me why I was where I was at and it was a very good place! I know.. that ..God is with you in this place! This is Bethel... This is the dwelling place of God! if your are not sure how you are going to get through this, God is with you. with college degrees by 2012. It's grace that taught my heart to fear and grace my fears relieved ..
tis grace that bought me safe thus far.. and grace will lead me home. Through the grace of God...it can get better and better!